Crop rotation was a normal practice for farmers of the ancient world. During the Roman Empire farmers followed a system known as ‘food, feed and fallow’. They would divide their fields into three sections then plant a food grain e.g. wheat or corn, a livestock feed, like barley or oats and then the third portion would be completely rested and given a chance to recover nutrients and organic matter. Crop rotation fell out of favour with farmers by the 1950s when ‘modern’ technology and chemicals made it possible for farmers to turn to mono-cropping and produce consistently high yielding crops using newly available fertilisers, pesticides and herbicides. There are many maize growers who have successfully grown maize in a field continuously, using heavy fertilisation programs and controlling insects and weeds with high levels of pesticides. South African farmers found that monoculture produced high yields and good profits. However, after an extended period of monoculture, farmers saw that growing the same crop in the same field year in and year out was leading to significant increases in the presence of pests and disease in their fields. Soil erosion was another problem they were encountering more than before. Profitability of crop production declined significantly in the 1980s and farmers faced increased risks in monoculture. They had to try something different – so they began implementing systems of crop rotation. Soil erosion is usually accelerated by cultivation and is often more severe under monoculture. Crop yield can decline with monoculture. Weeds tend to increase and become a problem. Soil fertility deteriorates, and levels of organic matter are low. Soil structure and water infiltration rates are lower in monoculture systems. Monoculture leads to increased pests, disease incidence and yield loss. Crop rotation is basically a system of growing different kinds of crops in recurrent succession on the same land with the purpose of improving sustainable production potential. It is a system implemented because it is either beneficial for the soil or for the economic returns – or both. A good rotation will provide for improvement in soil fertility and productivity and will usually include a legume crop to promote fixing nitrogen, a grass or legume which will improve the humus and a crop which will promote weed control. The choice of a rotation depends on crops adapted to the regions soil, climate and also the economic climate. The diversification that comes in a crop rotation programme holds many benefits including economic use of water available. Crop rotation has many agronomic, economic and environmental benefits compared to monoculture cropping. A well-planned crop rotation improves soil health considerably since there is increased organic matter, improved soil structure and a reduction in soil degradation. It can also result in higher yields and greater farm profitability in the long-term. Increased level of soil organic matter enhances water and nutrient retention. Improved soil status decreases dependence on synthetic fertilisers = lower input costs. Better soil structure improves drainage and reduces risks of water-logging during floods. Improved soil structure means less run off and less top soils lost. In many regions of South Africa wind erosion of top soils is a serious threat, improved soil structure and more organic matter reduces losses. Improved soil structure boosts the supply of soil water during droughts. Crop rotation is used to control weeds and diseases and problem weeds have been found to cause less damage in crop rotation than monoculture systems. Crop rotation, as against monoculture, limits infestations of insect and other pests and significantly reduces pesticide use = lowered environmental impact + lower input costs + increased profit margins. Leguminous crops – like soybean, beans, cow peas, ground nuts – in the rotation, fix nitrogen and bind it in the soil thereby increasing fertility and reducing the need for synthetic fertilisers. It is also not insignificant that crop rotation is a way of mitigating climate change. Reducing the use of synthetic fertilisers leads to reduced greenhouse gas emissions. Improved soil health combined with improved water retention = higher yields in the long term. Crop rotation is one of the easiest ways of maintaining soil productivity. Crop rotation is not something one decides upon suddenly. It is a carefully planned course of action. It is quite normal for a programme to be decided upon a number of years in advance. It is always a good idea to consult with local Grain SA development managers and other experts about the programme which would best suit your farming operations. Is it a deep or shallow rooted crop e.g. maize and sunflowers are deep rooted plants while wheat and beans are shallow rooted. Is it a broad leafed or narrow leafed plant? 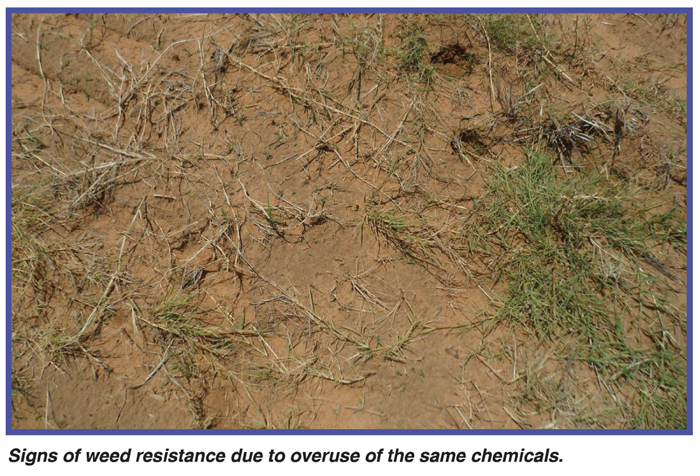 What herbicides will be applied, and do they have a long residual period which might cause damage to the follow-up crop in a rotation system? Ask other farmers which rotations have worked for them. In the North West the farmers like to follow a Year 1: Sunflower – Year 2: Legume e.g. beans or cow peas – Year 3: Maize rotation. The deep-rooted sunflower crop is followed by the shallow rooted legume crop which fixes nitrogen into the soil before the nutrient guzzling maize crop is planted. Crops of the same family should never be planted following each other simply because they are likely to share the same pests and diseases.